The PG 820 is the largest in the range of surface preparation and finishing machines. Equipped with Dual Drive Technology™ the PG 820 is among the market’s most powerful and efficent machines. Applications range from concrete floor preparation and repair to grinding and polishing of concrete floors as well as the repair and polishing of terrazzo and other natural stone. High power machinery capable of delivering extremely high production rates, increasing profit and saving valuable time. Multi purpose application possibilities. A highly versatile line of equipment. Comprehensively tried and tested on actual projects, ensuring technological effectiveness in the field in most applications and situations. Low tool and maintenance cost per square metre/foot. A unique 5-way sealing mechanism protects bearings and internal parts from aggressive concrete dust and slurry, which contributes to a longer machinery service life before first service and between subsequent services. The control box is clearly marked and easy to use. Regulates and controls various functions on the machine. Redi Lock is an instant and hassle-free system for changing diamond tooling. Robust construction ensures maximum protection and life of your diamond tools. 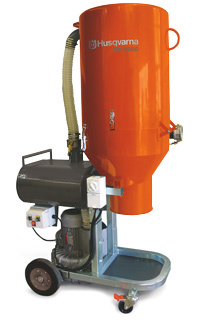 Triple-headed grinder with features and a range of applications previously unavailable. 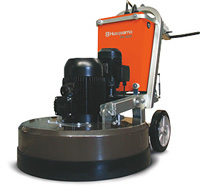 Extremely high production rates for rapid removal of tough heavy duty surfaces/coatings as well as floor polishing with an industrial and commercial capacity. A flatter, more consistent grinding surface than that offered by other 4 headed machines. Dustless application when used with a DC 5500. Can be used for both wet and dry grinding. Longer machinery service life thanks to the 5-way sealing mechanism, gear driven planetary head, premium quality belt, the spring steel head system and all zinc-plated steel parts. CCC Polished Concrete use different sized grinding tools including the PG820, PG680 and the PG530 which gives us flexibility and allows greater access on each site. Dual filtered vacuum to keep dust to a minimum.